The project consists of two buildings- a 24,000 square foot, 2-story jail housing pad and a 27,000 square foot single-story Justice Center. The second floor consists of cast-in-place concrete slab bearing on masonry walls. The single-story Justice Center with a partial mezzanine consists of a steel frame floor and roof bearing on masonry walls. The housing pad has a steel frame roof bearing on masonry walls and steel framing. Foundation for both structures is supported on shallow footings. This two-story, 45,000 square foot structure has tilt-up concrete exterior walls with a cast-in-place concrete slab and steel frame groove. In addition, the CWC has a maintenance facility which consists of a 24,000 square foot steel frame roof bearing on masonry block. 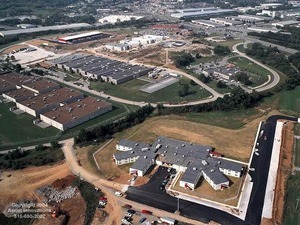 LPe is currently working on the structural design of this 80,000 square foot minimum security prison. This 4-wing, 2 story structure has concrete tilt-up walls with precast floor and roof (green roof). The central core consists of a steel frame roof supported on a combination of masonry and concrete tilt-up walls. This two-story 25,000 square foot structure has masonry block walls with a concrete slab and steel frame roof. The foundation is supported on shallow footings.